Maja asked me to send pictures and let you know how she's doing here in Las Vegas. I came home to Las Vegas with mommy a little over two years ago. Since then, she invited a human gentleman friend into our lives. I LOVE him! He loves me and pets me and plays with me and rolls me around and wraps me up in puppy hugs. We've decided to keep him. I have lots of friends, Sam, the Beagle up the street, comes down to visit a lot and I love my cousins Champie and Yukon, I get to go play with them a lot too. Poppy lets me come and pick up mommy from the theater and sometimes I get to go in and see other doggies...I've been boat camping with Napolean, a French Canadian Beagle who's poppy works for Celine DIon. And I met Arthur who's poppy is Elton John...that was cool He gave me his paw print. In my spare time, I'm learning how to sail a boat. 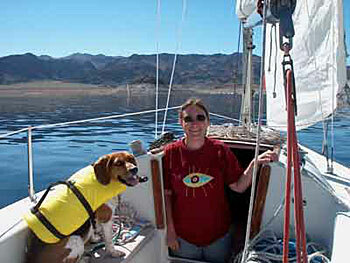 We go sailing on Lake Mead almost weekly. 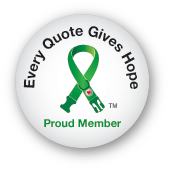 I am very safety conscious and ALWAYS wear my life jacket. I am very happy and hope that all my cousins at Beagles & Buddies find mommies and poppies to adore them as much as mine do.